For the pour over brewing method, the Hario V60 Metal Dripper produces a professional cup of coffee in your own home. The unique indentations lining the dripper contril the flow, timing, and temperature of the water giving you maximum control over the flavor. 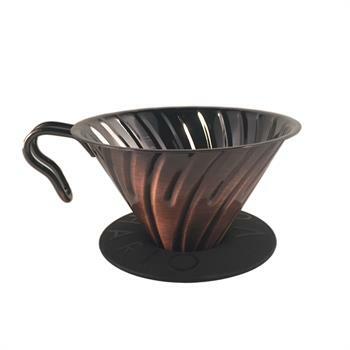 The Hario V60 Metal Dripper is stainless steel with a stunning copper finish and comes with a measuring spoon. Use Hario V60 02 Coffee Filters for best results. For 1-4 cups.